We offer a very successful palletised service, fast and cheap. We come at your residence and collect the boxes, suitcases, bikes, …, and whatever else you want to send. We can also do the packing, In our warehouse we prepare your shipment on a pallet with labels and documentation. We transport in our network to destination. You will be contacted to for delivery and it is unloaded from the truck at your front door. Prices are very competitive. First of all the transport is in a ‘consolidated’ manner, meaning that more shipments (well separated off course) occupy the truck. Secondly there less labour costs, as there is no delivery inside the residence and unpacking by a ‘moving’ company. We offer this service to all EU member states, overseas EU territories (Malta, Cyprus, Greek islands, Sardinia, Corsica,…), Norway and Switzerland. More questions about road transport, please check out the FAQ section on road transport. You want to receive a quotation, please fill out the quotation form. For bookings please contact us with the contact form. Make sure you understand the quote correctly and have asked us for the right volume. The final price is dependent on the volume and the distance. • We have already completed the booking form attached with your quote with the information provided to us. Please complete this form and sent it back to us. Upon receiving your booking we will confirm this. • Ordering packing materials, pick up date, …, all comments can be left on this booking form. • When packing your shipment consider that you use a sturdy box. A well packed box should withstand a fall from 1m. high on any surface or rib without damage to the box or its content. We advise double walled boxes, certainly for fragile items and heavy boxes (+15 kg). 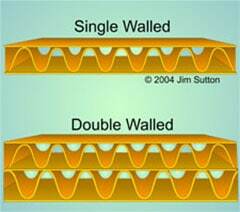 Clothes and other non-fragile items can be shipped in single walled boxes. • You can use any size box you like. Boxes /suitcase can be of different dimensions. It’s better to ship two small boxes over 1 big box. • Your shipment will need proper documentation for customs (only outside EU and overseas). • Our driver normally collects your boxes and other items from a ground floor/front door level. Please make sure the boxes,… are prepared. Unfortunately the courier cannot wait for last-minute packing if not advised on beforehand. If you cannot place your goods on the ground floor, please alert us prior to collection. • If you choose full packing by our services, our crew will bring all the packing materials and pack on the day of pick up. Please arrange for ample parking space in front of the residence. • Your goods will be brought back to our warehouse and measured/weighted for invoicing. You will receive an invoice and weight ticket. On request cash payments to the courier are possible. You will receive the invoice by e-mail. • Your goods are transported to destination and offloaded at the front door on ground floor.